My company recently published our Android app on the Amazon app store for Kindle Fire tablets. While getting ready to publish the app on the store, I realized that the list of Kindle Fire specifications that Amazon has here is neither developer nor customer support friendly. 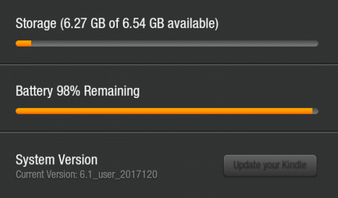 Kindle Fire devices show system version in this format: 7.5.1_user_5170020. This does not convey the Android OS version at first glance. So, if a user or a customer support representative says that your app is not working on a Kindle and they only give you the system version, you as a developer are not sure which version of Kindle it's failing on. If you are also debugging via USB on a Kindle device, Android Studio only shows you the Build Model and not the OS version. To solve these issues, I made the cheat sheet below to help Android developers quickly determine which Android OS version a Kindle is on. Hope this helps! Note: This table is as of March 28 2015.